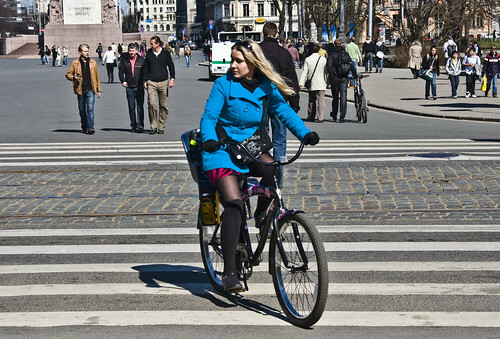 It's safe to say that Cycle Chic is alive and well in the Latvian capital, Riga. I was invited over by the Royal Danish Embassy and the Danish Cultural Institute to speak at their conference with a lecture entitled, "Marketing the Bicycle to the Sub-Conscious Environmentalists" and it was a wonderful experience and the embassy people were brilliant. I met loads of local people who choose to ride bicycles in the beautiful city. I saw many cyclists and they were all true "style over speed" candidates. No rush, just taking it easy. Important especially outside the old city where the traffic is thick. No agression, just a good, relaxed pace and attentiveness when negotiating their way through the cars and trucks. Textbook Cycle Chic. Not to mention the Slow Bicycle Movement. I was given a bike by a local chap, Karlis, and I spent the day riding around the city. 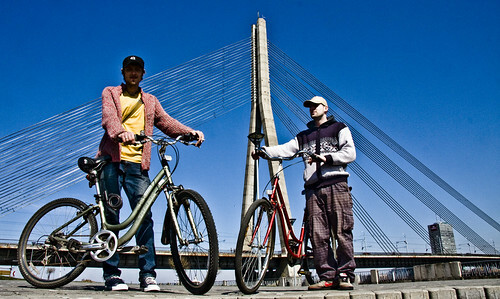 I met these two guys, Ivan and Andrew, and spoke with them about cycling in Riga. I'll be posting a little film in a couple of days about it. As well as some more photos of Riga Cycle Chic. Will you be publishing your lecture? Riga has some of the most beautiful women I've seen in a single city. Nice place to visit!